MUJI acrylic stamp for check list. I've also done a comparison with colored inks, showing the contrast with light and dark colored inks as well. The papers I have tested on were all Filofax brand. First, let's start out at looking at a basic black ink, which I think, is something everyone should have. As you can see, you will want to avoid using water-based dye ink (Momento, Tim Holtz, Hero Arts) with surfaces such as Filofax paper, since it will tend to bleed. Pigment Inks (Color Box, Craft Smart, VersaMagic) does not contain dyes. It does not soak in and stain the paper like a dye-based ink. That means the ink takes a little longer to dry on regular paper, but the color will remain on the surface, appearing more bright and vibrant. If you would like a Fast Drying Pigment Ink try Tsukineko Brilliance. VersaFine is oil-based yet water-soluble. It has the opacity of a pigment ink, but offers the quick drying convenience of a dye ink, but has a limited number of colors available. Here I have used Pigment Chalk Ink (VersaMagic). They are available in a wide range of very popular muted, pastel colors which dry to a matte finish. They also resist smearing, bleeding and fading. In this test, I wanted to see the difference in using a darker ink vs a lighter ink. On the top of the page, you can see that even though I used a dye ink, it is much less noticeable with the lighter ink. Even using a darker pigment ink may show some bleed through. These two dye inks had completely bled through. You can even point out some spots where some ink bled even more. Here again the difference in using a darker ink vs a lighter ink on diary pages. Pigment Chalk Ink on Diary Pages - darker ink vs a lighter ink on diary pages. A great thing about these Pigment Chalk Ink, is that it doesn't matter if you use a light or dark ink. There is no bleed through! 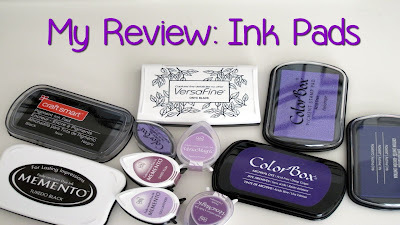 In conclusion, my favorite inks to use are Pigment Ink Pads. More importantly, Chalk Ink Pads. Many brands include VersaMagic Chalk Ink, Hero Arts HUE Chalk Ink, ColorBox Chalk Ink. The unique ink pad dew drop shape offers more options- use the narrow tip for corners and details or the round end for covering larger areas. Thank you, Jennifer! I just got my first Filofax so this is very helpful! I also wanted you to know, so that you can post to your Filofax fan base (since I don't have one), that I just got back from Blick's Art Materials on Beverly and had found the Leuchtturm 1917 pen loops on clearance for $1.77! I had just purchased from ebay for $4.99 plus shipping - major bummer! Oh, well - I've got two more for future Filofaxes (which I am desperately trying to justify more than one!). Anyway, the pen loops were at the front of the building tucked in the corner next to the canvases. I found regularly priced ones in another section that did not have the orange sticker with the hand written 1.97. They only have the black ones. Thanks again for all your helpful information!!! Jennifer, will the ones that don't bleed through fade faster if you are archiving your inserts? Just curious. Thanks!